The Swedish city of Örebro has a high number of cyclists with every fourth trip made by bike. The proportion of cyclists in the inner city is even higher (one third) and comparable to Copenhagen. The city is now expanding its cycling network to further facilitate cycling. The bike is an attractive way to get around in Örebro and cycling conditions are good. The city is flat and fairly compact with about 218 kilometres of separated pedestrian and cycle paths. The speed limit is 30 km/h on most streets. Nearly all citizens (92%) have access to a bike. Örebro has a long tradition of cycling as well as high political acceptance of the activity. The general plan adopted in 2010 states that short distances between different destinations are of great importance when aiming reduce the need of the car and promote cycling. One aim of the plan is to increase the number of residents per hectare of the built-up area. New areas should be located primarily within cycling or walking distance of the city centre. The city has had a SUMP since 2008, which emphasises the need for measures such as reduced speed limits and improved access for bikes and buses. 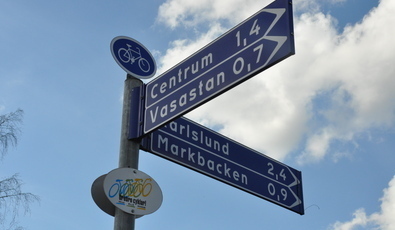 Örebro received the Swedish Cycling Association’s award “Best Cycling City” in 2003 and it has been involved in several international projects, including the European champion cycling city project CHAMP. The new cycling network plan contains 15 high-quality cycling corridors to facilitate cycling and reduce travel time.>Two corridors have already been completed while another 5 are in the pipeline. Snow removal is one of the most important issues for maintaining a high number of cyclists during winter in Sweden. Cycle paths are given priority over roads. Örebro has a priority plan for snow removal and sanding in the winter, and for the removal of sand in spring. Örebro guarantees to remove snow from cycle paths within 12 hours of the end of snowfall. Great emphasis is placed on putting sand on icy roads and cycle paths in winter. New cyclists as well as commuters are important target groups when it comes to communication and PR. The city organises a cycling school every summer, teaching adults, mainly immigrant women, how to ride a bike. The healthy cyclists campaign aims to change the travel behaviour of commuters. The campaign encouraged 150 people start using a bike instead of a car to improve health and reduce CO2 emissions. Health tests before and after the campaign measure improvements. The results from the people taking up cycling will be compared with the results of a control group still driving their cars. Evaluations of the new cycling corridors show that cyclists are very pleased with the new corridors, which have a uniform design with special signage and orange lines. Altogether, the 15 corridors will connect the most important locations and provide fast and comfortable cycling, especially for commuters. The city has also developed a map of the cycling network and introduced a dedicated guidance system for cyclists, with more than 500 signs showing destinations & distances.